Intraosseous hemangiomas are rare, benign bone tumors usually affecting the bones of the axial skeleton. Its incidence in the long bones is extremely rare. We report a 19-year-old boy with solitary intraosseous hemangioma of the proximal ulna. Radiographs and computed tomography images showed a well-defined osteolytic lesion involving the right proximal ulna. Magnetic resonance imaging showed intermediate signal intensity on T1-weighted images and increased signal intensity on T2-weighted images with internal trabeculae and peripheral post-contrast enhancement. Postcurettage histologic diagnosis of intraosseous hemangioma was made. 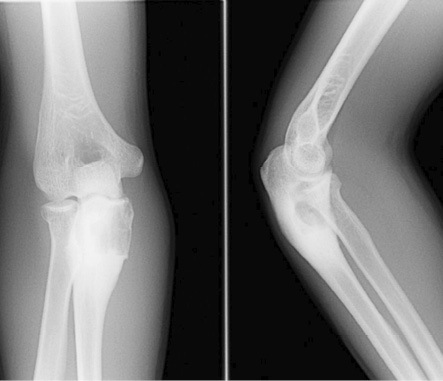 Figure 1: Frontal and lateral radiograph of elbow shows an expansile osteolytic lesion with a narrow zone of transition and surrounding sclerosis in the proximal metaphysis of the right ulna. A 19-year-old boy presented with right elbow pain of one-week duration. The pain persisted despite conservative therapy consisting of analgesics and non-steroidal anti-inflammatory drugs. There was no history of trauma. No soft tissue swelling or tenderness was noted on physical examination. The elbow had a normal full range of movement including supination and pronation. The elbow radiograph showed an expansile osteolytic lesion with surrounding sclerosis and a narrow zone of transition in the proximal metaphysis of the right ulna. There was no cortical erosion, periosteal reaction, or pathological fracture [Figure 1]. Further evaluation with pre- and post-contrast magnetic resonance imaging (MRI) showed a 2.1 × 1.6 × 3.1 cm lesion in the proximal metaphysis of the ulna, which was hyperintense on T2-weighted imaging (T2WI) and isointense to skeletal muscle on T1-weighted imaging (T1WI) [Figure 2a and b] and showed internal trabeculae. Mild rim enhancement was present on the post-contrast fat-saturated (FS) T1WI [Figure 2c]. Computed tomography (CT) showed a lobulated osteolytic lesion with well-defined margins, internal trabeculae, and surrounding sclerosis [Figure 3a]. Technetium-99m-methylene diphosphonate (99mTc-MDP) bone scan revealed a focus of intense tracer uptake in the proximal ulna [Figure 3b]. No abnormal tracer uptake was detected elsewhere. Based on the patient’s age and imaging features, differential diagnosis raised were those of a non-aggressive bone tumor, such as fibrous dysplasia, giant cell tumor, and aneurysmal bone cyst. The patient underwent open surgery involving open biopsy and curettage, followed by bone grafting. Histopathology revealed proliferative, branching blood vessels within the tissue lined by endothelial cells with solid nests of bland epitheliod endothelial cells [Figure 4a and b]. CD31 immunomarker showed endothelia in the proliferative vessels with patent lumina [Figure 4c]. The final diagnosis was IH. The patient had an uneventful postoperative course. On six-month follow-up, the patient was asymptomatic and the osteolytic lesion showed interval healing with areas of sclerosis [Figure 5]. 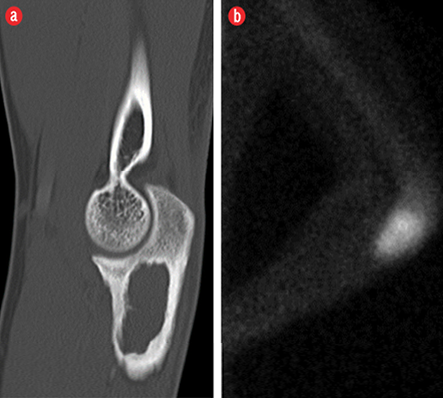 Figure 2: Pre- and post-contrast axial magnetic resonance images revealed a lesion in the proximal metaphysis of the ulna, which was (a) isointense on T1-weighted imaging and (b) hyperintense on fat-saturated T2-weighted imaging with internal trabeculae. (c) Post-contrast fat-saturated T1-weighted imaging demonstrated mild rim enhancement. Figure 3: (a) Sagittal reconstructed computed tomography image showed a lobulated osteolytic lesion with well-defined margins, few internal trabeculae, and surrounding sclerosis in the proximal metaphysis of the ulna. (b) Technetium 99m-methylene diphosphonate bone scan showed a focus of intense tracer uptake in the proximal ulna. Figure 4: Histopathology of the excised specimen showed (a) branching proliferative blood vessels lined by bland endothelia and separated by inflamed edematous fibrous tissue. (b) It also showed solid nests of bland epithelioid endothelial cells in keeping with epithelioid hemangioma component. (c) The CD31 immunomarker highlighted endothelia in the proliferative vessels with patent lumina, magnification = 200 ×. 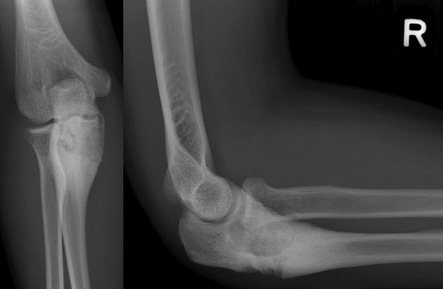 Figure 5: Follow-up frontal and lateral radiographs of the right elbow after six-months revealed areas of sclerosis in keeping with expected healing. On 99mTc-MDP bone scans, long bone IH usually shows normal uptake. However, in some cases, they may demonstrate decreased or increased activity.7 This may be explained by the variable internal vascular nature of the lesion. In our case, the lesion showed increased uptake on bone scan. Small asymptomatic long bone IH usually require no surgical treatment. Curettage and bone grafting are usually reserved for large, symptomatic lesions or lesions with pathologic fracture.1 In our case, the lesion was symptomatic, with a risk of pathological fracture and curettage with bone grafting was performed. Unlike axial bone hemangioma, imaging diagnosis of an appendicular bone hemangioma is challenging, due to its rarity and diverse imaging appearances. Histopathological examination usually confirms the diagnosis. Hemangioma involving the proximal ulna is extremely rare; however, a radiologist should be aware and consider this entity in the differential diagnosis of a medullary based, expansile, osteolytic lesion with soap-bubble appearance affecting a long tubular bone, particularly on CT and MRI. 1. Matsumoto K, Ishizawa M, Okabe H, Taniguchi I. Hemangioma of bone arising in the ulna: imaging findings with emphasis on MR. Skeletal Radiol 2000 Apr;29(4):231-234. 2. Cha JG, Yoo JH, Kim HK, Park JM, Paik SH, Park SJ. PET/CT and MRI of intra-osseous haemangioma of the tibia. Br J Radiol 2012 Apr;85(1012):e94-e98. 3. Rigopoulou A, Saifuddin A. Intraosseous hemangioma of the appendicular skeleton: imaging features of 15 cases, and a review of the literature. Skeletal Radiol 2012 Dec;41(12):1525-1536. 4. Mirra JM. Vascular tumors. In: Mirra JM, Picci P, Gold RH (eds) Bone tumors. Clinical, radiographic, and pathologic correlations. Philadelphia: Lea & Febiger, 1989: 1335-1478. 5. Xia Z, Sittampalam K, Howe TS, Lo NN. Successful treatment of solitary intraosseous haemangioma of the femoral neck. Singapore Med J 2015 Apr;56(4):e65-e70. 6. Chawla A, Singrakhia M, Maheshwari M, Modi N, Parmar H. Intraosseous haemangioma of the proximal femur: imaging findings. Br J Radiol 2006 Aug;79(944):e64-e66. 7. Ching BC, Wong JS, Tan MH, Jara-Lazaro AR. The many faces of intraosseous haemangioma: a diagnostic headache. Singapore Med J 2009 May;50(5):e195-e198.